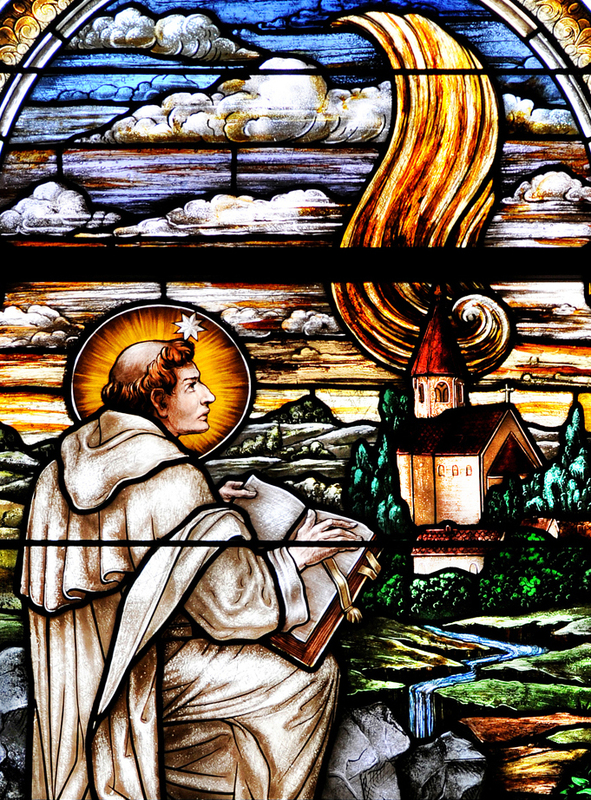 In order to better understand the role of Dominicans in the world today, we must be familiar with the early foundations of the Order of Preachers. The following text is a summary of the history and heritage that is ours as followers of St. Dominic. As the Middle Ages approached its peak, the pope grew in prominence beyond any king in Christendom. The spiritual life of the Church was in the process of renewal, but ignorance and division was still a threat. In 1170, Dominic de Guzman was born in Caleruega, Spain. His mother was Bl. Jane of Aza, renown for her charity to the poor. Dominic’s father was a nobleman named Felix de Guzman. Their eldest son Anthony would become a Canon of St. James, and their second son, Mannes, would eventually follow his younger brother in the Order of Preachers. Mannes was later beatified. Two nephews of Dominic would also join the Order. Before his mother conceived him, she saw in a vision that a dog with a burning torch in its mouth would come forth from her womb and set the world aflame. Later, Bl. Jane saw the moon on her son’s forehead, yet at his Baptism, his godmother perceived it as a star. The boy was christened after St. Dominic of Silas whose nearby shrine was a favorite of his mother. As a boy, Dominic was sent to his mother’s brother for seven years to receive instruction. His uncle was a parish priest in Gumiel d’Izan. Even as a child, Dominic avoided games and denied himself the comfort of a bed, choosing instead to sleep on the floor. At the age of 14, Dominic went to the university in Palencia, in the kingdom of Leon. Around that time, there was a terrible famine. To give alms to the poor, he sold his possessions, even his precious annotated books, believing that the living skins of the famished were more important than the dead skins of his books. Music was studied in the quadrivium. Consequently Dominic loved to sing; among his favorites were the Ave Maris Stella and the Veni Creator. His study of the arts lasted six years. In 1190, Dominic was appointed to the canonry at Osma, about twenty miles from his hometown of Caleruega, where he pursued theological studies. While there, he was ordained to the priesthood. The Canons Regular were essentially clerics who customarily followed the Rule of St. Augustine. He continued with this life for nine years. During his nightly vigils, Father Dominic grew in holiness as he wept for sinners. Of the many books he read, he was particularly fond of the Conferences of the Desert Fathers by John Cassian. When Dominic was 31 years old and the subprior of his community, his prior, Diego d’Azevedo, was named Bishop of Osma. The preachers held disputations from town to town, attended by the lowly and the noble alike. At Fanjeaux, arbiters held a trial by fire to test the authenticity of the manuscripts written by Dominic and those of his adversaries. The text written by St. Dominic flew out of the flames three times while the text of the heretics burst into flames. A similar miracle took place at Montreal. The Albigensians were extremely austere, but Dominic surpassed them all by his charitable sacrifices. He would eat no more than a bit of dried fish or a little bread and soup. Women who often fed him testified that he never ate more than two eggs, and his wine was about two-thirds water. Dominic wore an abrasive hairshirt and had an iron chain forged around his waist. He slept very little, and when he did, always on the floor, preferably in the chapel. Exhausted from his vigils, Dominic sometimes napped on the side of the road. It was his practice to carry his shoes until he got to town. Once when he needed directions, adversaries maliciously sent him along a path of briars, but he was happy to bear yet another sacrifice for the love of God. Dominic once told a pompous bishop, “Heretics are more easily won over by examples of humility and virtue than by external display or a hail of words. Should we not rather arm ourselves with devout prayers and, carrying before us the standard of true humility, proceed in our bare feet against Goliath?” As hard as he was on himself, however, Dominic was lenient with others. On the night of July 22, 1206, the feast of St. Mary Magdalene, on a hill of Fanjeaux overlooking the little town of Prouilhe on the plain, St. Dominic saw what appeared to be a globe of fire descending upon a shrine of Our Lady. The Seignadou—sign of God—occurred again the next two nights. From this, Dominic understood that he was to establish a monastery of nuns at Prouilhe. In the months that followed, Dominic converted nine young women. Consequently, the first Dominican convent opened on December 27. St. Mary Magdalene, the penitent Apostle to the Apostles, therefore, would become the patroness and mother not only of the converted nuns of Prouilhe but also of the entire Order of Preachers about to be born. Bishop Diego returned to his diocese in 1207, but died soon after. St. Dominic then took charge of the small band of preachers. Already at Prouilhe there was a double monastery (a priory next to the monastery), but the brothers were not yet bound to Dominic canonically. Brother Dominic always hoped to be martyred but thought himself unworthy. So he fled places of honor and drew near to mistreatment, where people would spit and throw filth at him. Aware of looming ambush, he approached the place of danger while singing in plain view. His courage and faith, however, intimidated the would-be assassins, who did not attempt their evil mission. Peter of Seila gave Dominic large stone buildings at Toulouse and became his follower. While in this city, the small fraternity attended lectures in theology. Toulouse was the See of Bishop Foulques, who greatly supported the preachers. In 1215, Dominic accompanied Foulques to Rome for the Lateran Council. While in Rome for the Council, it is believed that St. Dominic met St. Francis of Assisi. Both of these young men, on fire with the love of God, would establish a new kind of religious life, one which is mendicant and apostolic. 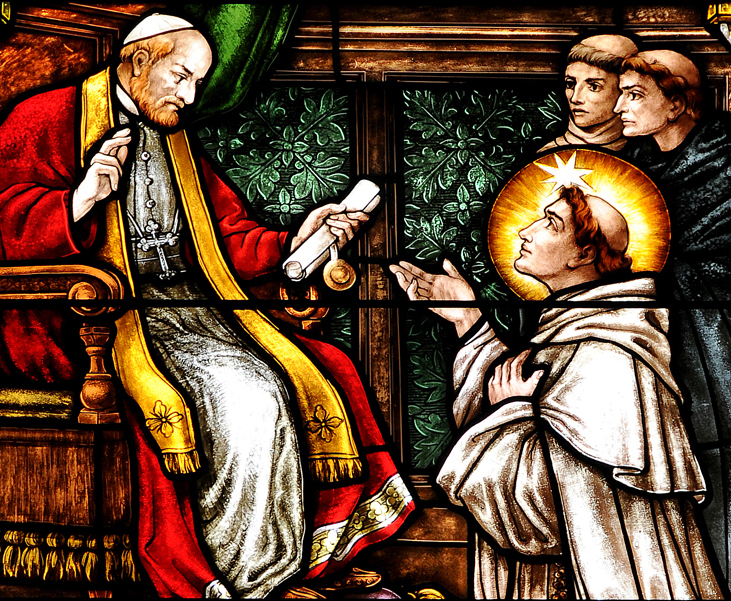 Members of both Orders call both saints “Holy Father.” For centuries, Dominicans have customarily invited a Franciscan priest to preach on the feast of St. Francis, and vice versa. Pope Innocent III was inspired to approve these new Orders because he saw in a dream these saints reaching up to support the tottering Church, lest it fall to ruins. Today in St. Peter’s Basilica, colossal statues of St. Francis and St. Dominic flank the sides of the Chair of St. Peter. In Rome, Bishop Foulques and St. Dominic petitioned Pope Innocent III for the right to establish a new Order of Preachers. Until that time, preaching was the proper function of bishops. The bold prospect of having an order whose priests cross diocesan boundaries to preach as needed would be a great privilege, yet clearly the time had come for such a development. Dominic was worthy of the responsibility. Pope Innocent asked Dominic to, with his brethren, choose an existing Rule by which the religious order would be governed. Hence, after the Lantern Council, Dominic and his companions chose the Rule of St. Augustine. To this short monastic Rule, Constitutions were added. From thenceforth, the preachers would be generically monastic, yet specifically “friars” not bound to a particular cloister nor to manual labor. For the friars, even the monastic elements of their life acquired an apostolic thrust; for instance, the Liturgy of the Hours was celebrated more succinctly so they could devote more time to study and preaching. Bishop Foulques then gave the Friars Preachers charge of three churches, to each of which priories were added. The first was St. Romain in the cathedral city of Toulouse; its priory was a model of simplicity. By the summer of 1216, the friars had grown in number to sixteen. The pope wanted Dominic to stay at the Lateran for a while, so Honorius appointed him to be the Master of the Sacred Palace (a theological advisor to the pope, a teacher of the papal court, and a censor of books). Since that time, this position has traditionally been held by a Friar Preacher. While in the Eternal City, Dominic made pilgrimages to the great Christian shrines. Once, while praying in the old St. Peter’s Basilica, St. Dominic had a vision. The Apostle Peter handed him a staff, and the Apostle Paul handed him a book. Together, they spoke to Dominic, saying, “Go and preach, because you have been chosen by God for this work.” Dominic then saw all of his spiritual children preaching two by two throughout the world. From that time on, St. Dominic was often seen on the road carrying a walking stick and the Epistles of St. Paul. He also carried the Gospel of St. Matthew, and could recite these Scriptures by heart. St. Dominic was allowed to return to Toulouse in May of 1217, but the reunion was short. 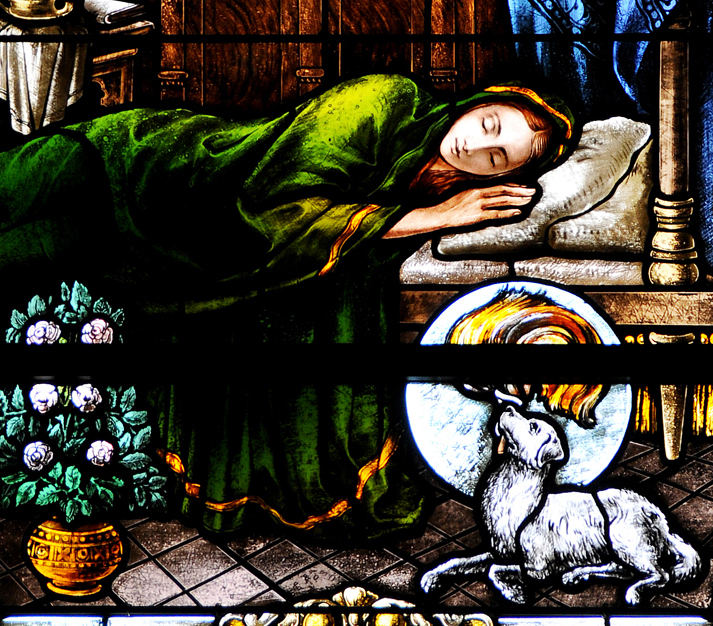 He planned to send his sons far and wide on the feast of the Assumption. They protested because their number seemed to be too small, but Dominic replied, “Do not oppose me, for I know very well what I am doing. The seed will molder if it is hoarded up; it will fructify if it is sown.” In time, his prophecy proved true. Instead of dissipating, the Order grew rapidly, and its fruit likewise multiplied. Consequently, before the great dispersion, the whole Order gathered for the last time at Our Lady of Prouilhe. The congregation was stunned by the unusual severity of Dominic’s sermon. It was probably on that occasion that the brothers professed their vows in his hands; hence the custom of making profession on the Assumption is still common. Coincidentally, St. Dominic appears today in the painting of the Assumption in St. John Lateran. When the time had come, he sent most of the friars to the universities at Paris and Bologna. This emphasis on study has always been an integral component of Dominican formation. Many professors soon entered the Order. Dominic, the first “Master” of the Order, sent other friars to Rome and to Spain, while the remaining few continued the mission in southern France. Dominic himself grew in hope that he would be allowed to preach among the Tartars and receive martyrdom, but this opportunity never came. 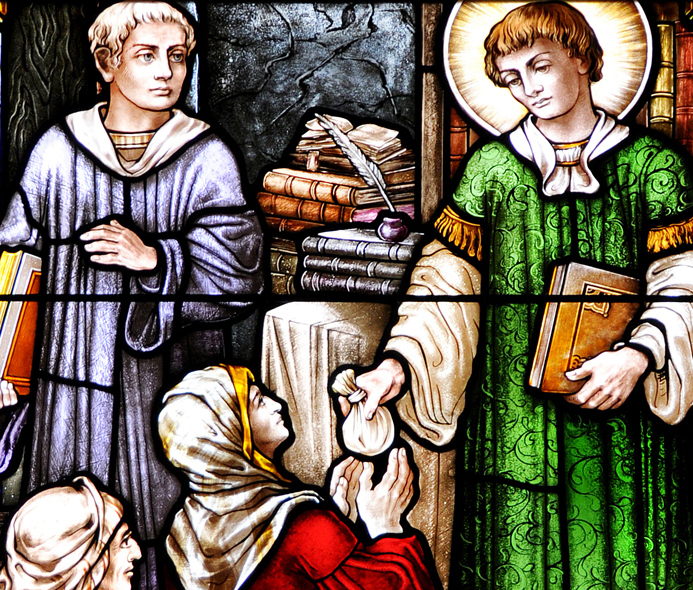 To his brethren, Dominic was exemplary in mortification, doctrine and contemplation. Three times each night, he would flagellate himself to blood—once for his own salvation, a second time for sinners, and a third for departed souls. Other Dominican saints would do the same. Dominic habitually wept for sinners—in the towns he passed, while celebrating Mass, and during his vigils. He was heard crying, “O Lord, what will become of sinners?” When on the road, Dominic would either instruct his companions or wander off to pray. His most evident characteristic was that he always spoke to God in prayer or about God to others. By January 1218, Dominic had traveled back to Rome by foot. At that time an important canon lawyer, Bl. Reginald of Orleans, sought to follow Dominic but became bedridden with sickness. Our Lady came to anoint Reginald and to show him the full habit of the Order of Preachers, with the addition of the white scapular. Reginald recovered and the Order soon adopted the addition to its habit. 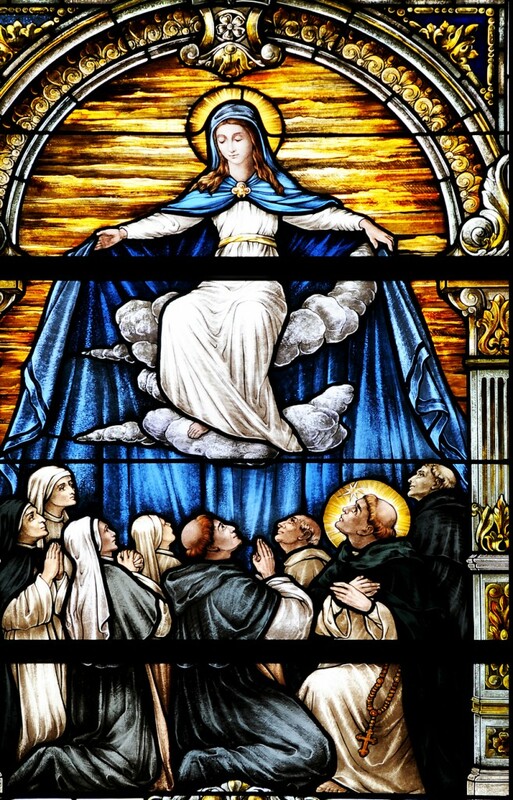 St. Dominic too was gifted with visions of Our Lady. Due to the generosity of Pope Honorius, a Dominican priory was established at San Sisto on the Appian Way. 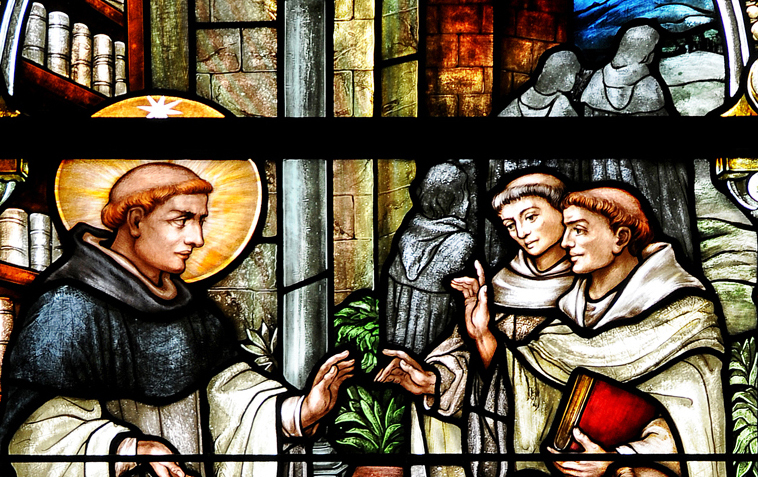 Dominic, having received a revelation from God, called the brethren to the chapter room to announce the proximate deaths of four friars—two physically and two spiritually. Soon thereafter, his prediction proved true, for two men died, and two others left the Order for worldliness. The community at San Sisto had grown very numerous. One day, Dominic was informed by the procurator that their begging had produced almost no food. He ordered the brethren to nevertheless gather at table for the meal. He then prayed. Suddenly two young men, or possibly angels, came into the refectory to dispense a portion of bread and wine to each friar. The Pope asked Dominic to reform and organize the more or less independent nuns of the city. By February of 1220, he gathered many of the nuns together at San Sisto. The diplomacy he exercised to overcome protests and achieve this unfavorable organization must have been inspired. He called Mother Blanche from Prouilhe to take charge of the monastery. The friars meanwhile moved to the ancient Basilica of Santa Sabina, another donation from the pope. For centuries, the Masters of the Order have managed the Order from there. In 1220, the first General Chapter of the Order was held in Bologna around Pentecost. 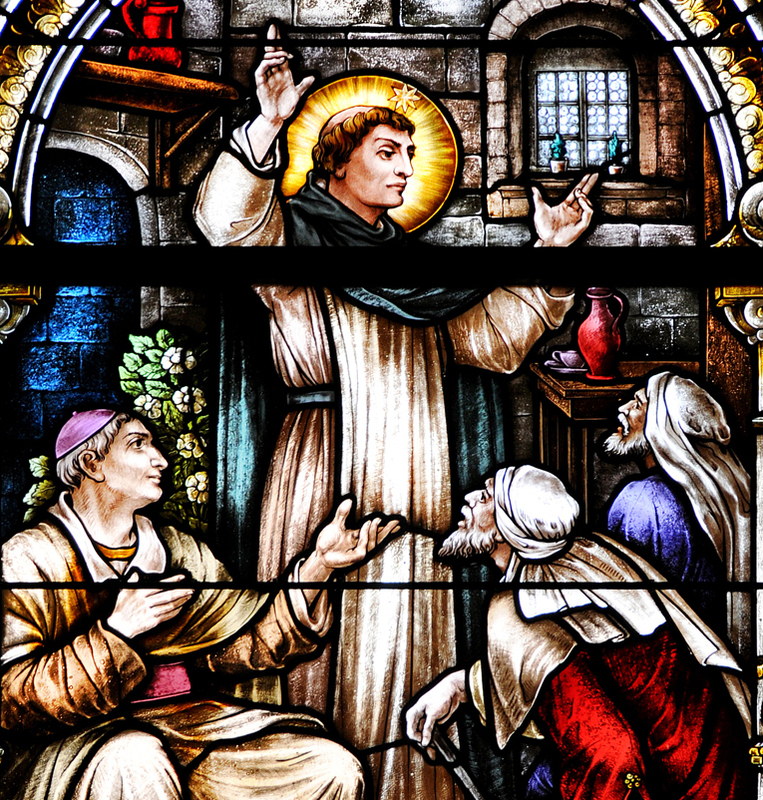 Dominic recommended that all economic matters be handled by the lay brothers, freeing the friars to devote their them to preaching, but the Chapter Fathers voted against him. Dominic preached throughout Italy for a year until the second General Chapter was once again held in Bologna. By then, his health was declining, yet he continued to walk from town to town preaching. By mid summer, Dominic had spent his strength. Heaven had warned this “athlete of Christ” that his life was about to end. His work was bearing fruit. Already the Order had grown to eight provinces: Spain, Provence, France, Lombardy, Rome, Germany, Hungary, and England. By the time he reached Bologna in August, the weather was very hot and humid. In his final hour, Dominic told the brethren, “Till this day, God, in His mercy, has kept my virginity pure and unstained. If you desire this blessed gift of God, hold yourselves apart from everything that can conjure up evil, for it is by watchful care in this that a man is loved by God and revered by man. Be eager in your service of God; strengthen and widen this newborn Order; increase your love of God and your keen observance of the Rule; grow in holiness.” Only a few more words were exchanged. After his confession, Dominic directed his sons to begin the Commendation of the Dying. During its recitation at around 6 o’clock in the evening, he stretched his arms toward heaven and died. It was Friday, August 6, 1221—fittingly the Feast of the Transfiguration. 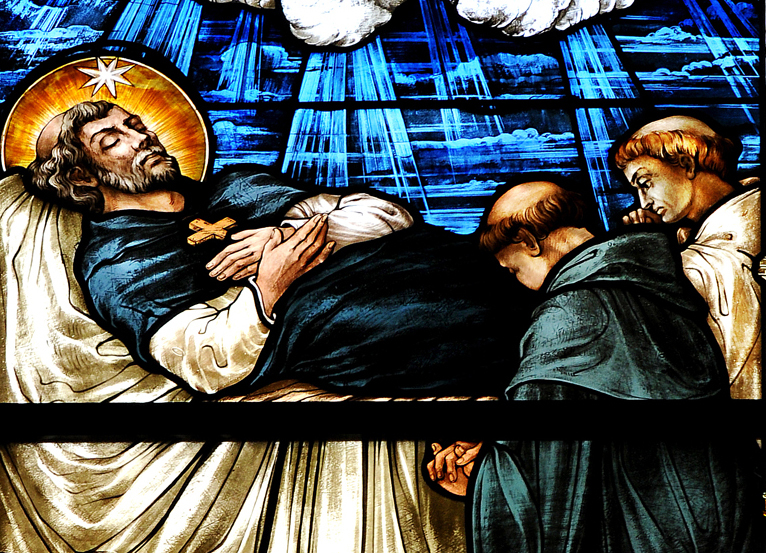 St. Dominic had lived 51 years. Miracles followed and devotion to the saint grew, so the church building needed to be expanded and Dominic’s body moved. Hundreds of people of every rank attended the Translation of his relics on May 24, 1233. When the stone covering his remains was lifted, a gentle aroma, like a sweet perfume, filled the air. The sacred relics have since been revered in a sepulcher befitting his glory. Within a year after the translation of his body, after collecting depositions and testimonies, Dominic was canonized a saint. His feast is now celebrated on the eighth of August. Adapted and used with permission of the Dominican Province of St. Joseph.